99designs is a freelancer platform specializing in design. As a client, you can work directly with the designer of your choice or launch a competition where multiple designers participate and you select the winner - a great option if you’re in the market for a new logo. The company supports you in crowdsourcing designs for all elements of your branding, offering both value for money and a wide range of choices you won’t find elsewhere. 99designs is great for logo design, website branding, social media graphics, and much more. Simply The Number 1 Place For Logo Design. 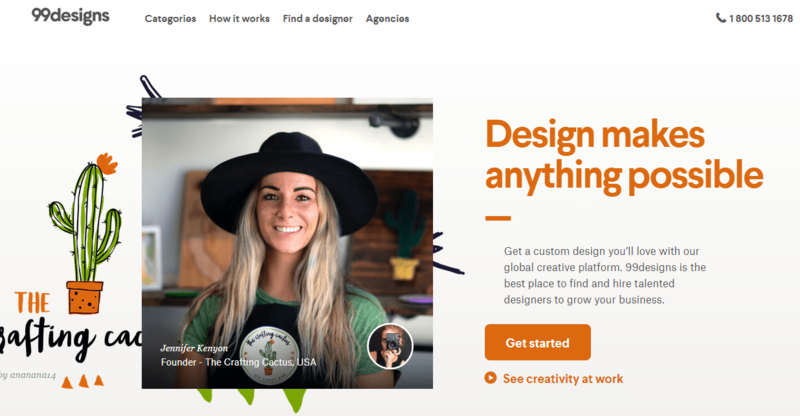 99designs is a Melbourne-based freelancer platform that allows you to crowdsource artwork from its database of over a million graphic designers. The platform is a good choice for small- and medium-sized businesses that want to hone their brand identity but may not necessarily have the funds to invest in a pricey design firm. 99designs is best known for its logo design contests, but it also offers a wide range of other products to build your branding arsenal. If contests aren’t your thing, you can also work one-on-one with designers. You can view their portfolios through the platform, invite them to a job, or simply ask for a price quote. As popular as 99designs may be, there are important considerations you have to be mindful of. For example, while it’s nice that you’re offered a money-back guarantee, would it necessarily be in your best interest to opt for one? And while some of the products are great value for money, can you find them for cheaper elsewhere? Ultimately, determining whether 99designs is right for you depends on your budget and what you’re looking for in your logo design process. 99designs offers two main options for logo design. You can work directly with a designer, or start a contest. Each option has its own set of benefits and drawbacks. Working directly with a designer can be great if you already have a clear idea of the design you want and just need someone with artistic skill to make it a reality. It’s also the more time-efficient option, as you won’t have to keep track of multiple designers. 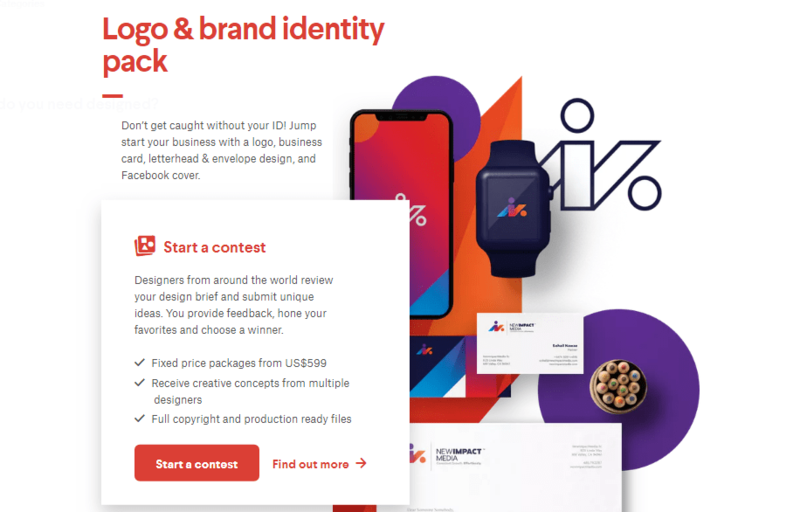 A logo design contest is ideal if you’re just starting out with your company branding and have little experience in design. You should note, however, that this option takes significantly more time to moderate. Since I wanted a logo for my personal blog but wasn’t sure exactly what I wanted it to look like, I opted for the logo contest. The opportunity to work with multiple designers meant I could see numerous different styles, ideas, and interpretations – and then pick my favorite. Besides, it sounded like fun! 99designs guided me through a questionnaire so I could establish my preferred visual aesthetic. First, I was asked to choose my favorites from a selection of premade logos. 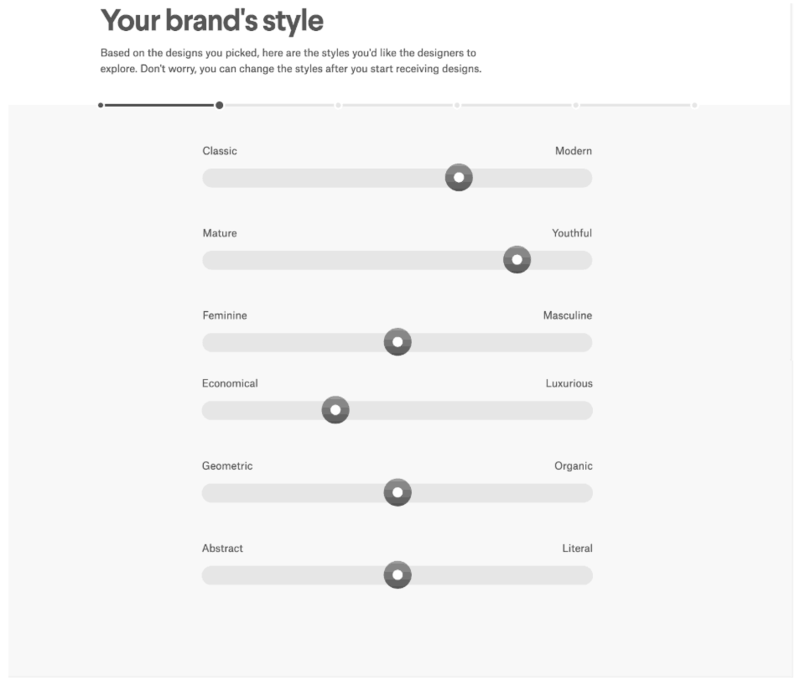 I particularly liked that I could communicate my preferences visually, without having to worry about the miscommunication that can happen when trying to describe style and feel. Many design contest platforms only include a written brief, so this extra step was a definite bonus. After I chose my favorite premade logos, 99designs transferred this information onto a sliding graphic, where I got another opportunity to specify my ideas for every factor of the design. Once again, this feature excelled in translating my ideas into design-relevant lingo; it meant that I could communicate easily with artists even though I have no background in graphic design. Other online logo makers, like Tailor Brands and DesignMantic, automate too much for my liking. So I was happy to be able to edit the style sliders if I didn’t like 99designs’ AI assumptions. However, I wish there were visual examples in this section, as some of the words were obscure; for example, what’s the difference between “Geometric” and “Organic”? Next, I was asked to select color palettes. Color is an essential part of branding, so having control over this section was massively beneficial. Different hues are known to inspire different feelings, and I like that 99designs included insights about the impact of my color choices. This meant that I didn’t have to do extra research outside of the platform. Finally, I was given the option to create a traditional written brief. 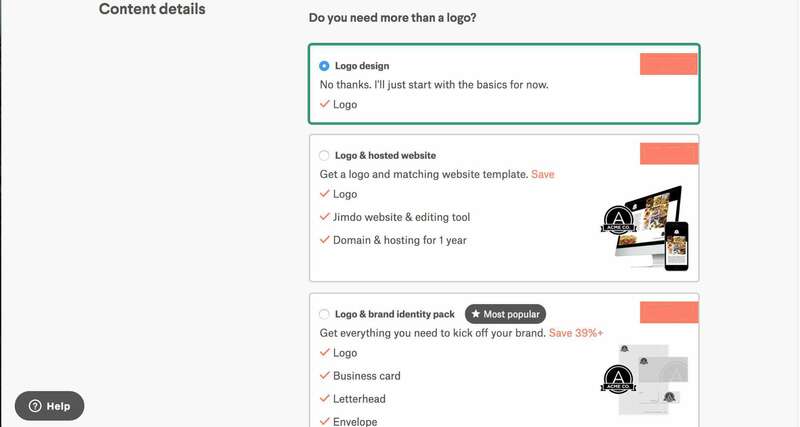 This was a relief, because many logo design services, such as Logojoy and LogoMaker, only ask automated questions and don’t allow you to describe what you need in your own words. After creating my brief, I chose all the practical options that determine how the competition should run. The varying price plans offer a number of different elements, and I could specify things like contest duration, privacy, and whether or not the prize money was guaranteed. I was disappointed to learn that many top-level designers participate only in guaranteed contests. 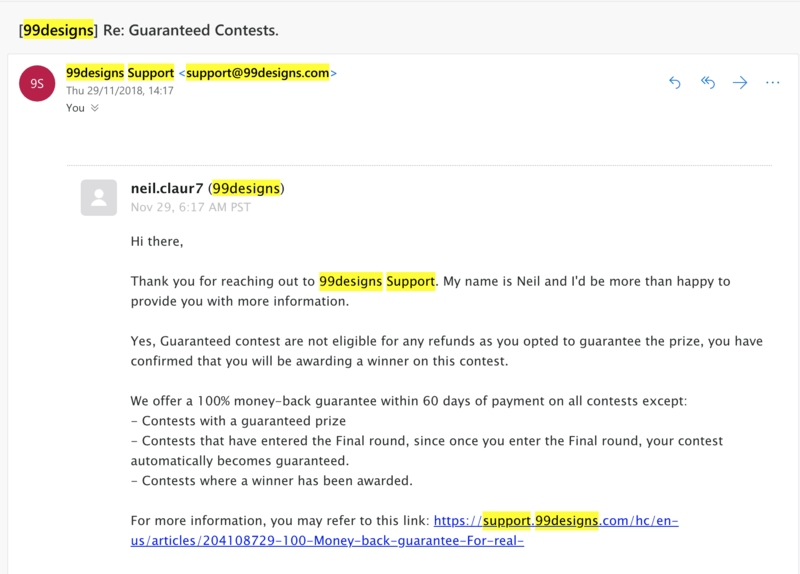 This meant that if I wanted to ensure the best designs by setting up a guaranteed contest, I’d have to forgo the money-back guarantee. Most contests take seven days. However, you can opt for a shorter duration if you’re in a rush. Accelerated competitions can take a minimum of 24 hours, but there are additional charges if you choose to speed things up. The qualifying round lasts four days. Designers submit concepts, and you get the opportunity to rate and respond, before eliminating the ones you don’t like. Next, you select your finalists. You have four days to narrow down all the entrants to six finalists. The final round takes three days. You can work closely with the designers to perfect the final logo, before choosing which artist is the overall winner. Once the contest is launched, you also have the option to invite designers to participate. You can send up to 50 invitations a day for no extra cost. This is a very useful feature, as it’s a great way to boost interest in your contest. After I launched my contest, I was transferred to a virtual platform where I could view all the entrants side by side. The user interface is simple, so it was easy to navigate through all the options and communicate with the designers. And I like that the platform included an ongoing countdown, as this made it easy to monitor progress. Unfortunately for me, the number of entrants quickly became overwhelming. This can be a definite drawback if you happen to have other projects to work on at the same time. That’s why having control over how to curate the designs made it easier to keep track of everything. There was also a seperate tab for messages from artists or prospective entrants. To monitor the contest, I could click on any of the designs to see a larger version with a comment section to the right. This is where you can provide feedback, rate work, and eliminate designs. This is particularly useful, as it allows you to develop the initial submission, and potentially grants you an unlimited number of revisions. However, note that designers aren’t obligated to provide edits. Some entrants never responded to my comments, which was frustrating because I actually liked their designs. It’s possible they thought the fee wasn’t high enough, or that I was likely to choose another design. Whatever the reason, this was a definite drawback. It would be good if there were a set number of revisions mapped out at the start. Once I decided on my favorite design, the artist had five days to hand over the copyright to my logo. At no extra cost, I received all the necessary file types, including the original vector file, vector EPS files in both CMYK and RGB, and a JPEG and PNG. 99designs offers all the basic components that make a design contest platform. It asks intricate questions to hone in on your needs, grants access to a wide database of designers, and uses a handy interface to manage the competition. However, depending on your price plan, the platform also includes features for a wider range of branding tools. Alongside the standard logo design package, 99designs has price plans to develop branding. You can opt to create a full brand identity, social media presence, or a hosted website. These extras can be very useful, as logo design is only a small part of your company’s visual branding. If you choose to work on your identity, you get a logo, business card letterhead, envelope, and Facebook cover, as well as step-by-step support to guide you through the whole process. If you’re just beginning in business, this option is a great starting point. If you’re building an entire website, 99designs offers numerous options to develop your brand’s online presence. The hosting is provided by Jimdo, which is a reputable company. If you’re hosting an online store, however, you only get a year’s subscription to Jimdo’s “Pro” plan. This plan offers no credit card gateway, and the only option is to use PayPal for payments. But if you just want a straightforward promotional website, then Jimdo’s simple design-templates are a great starting point for designers to expand on. However, if you already have a web development team, you can receive the website design in internet-friendly files (such as Photoshop) and manually upload them to your domain. And if you’re a small-business owner or blogger, you can opt for a customized WordPress theme, which is easy to edit and make live once you’ve chosen the winning design. I think the variety of choices is impressive, as it shows that the people behind 99designs understand the many forms a website can take and know to provide options for users of all kinds. Sometimes, too many options can be a bad thing. Once my contest reached over 400 designs, I started struggling to choose the best from the entrants. That’s why I loved the fact that I could create opinion polls and send them to friends and co-workers. Creating polls was easy, but each poll restricted the number of designs to just eight – a frustrating limitation. It is possible to create more than one poll if you want to add more options from other designers, but unlimited options and combinations still would have been ideal. Splitting them up into seperate polls felt like a hassle. Still, I loved this feature because I’m notoriously indecisive. But another way it can be beneficial is if you’re working with a team. Often, it’s not just the decision of one person; you may need to speak to members of the board, colleagues, or even managers. Creating a poll is an easy way to share results and collaborate with other company members before making a final decision. Before launching a contest, you have the option to make it private. This setting prevents anyone else from viewing your competition, and will also keep the final results out of Google searches. While this privacy feature might seem minor, I was happy to have it. I knew that flooding search engines with my development process was not the best idea. Hiding your logo design competition helps reduce copyright risks. Many novice designers will search for logos online to inspire their own work. Often, this results in very similar designs popping up across the board. So, to minimize the threat of copycat designs, opting for a private contest is a great contingency. However, I was a bit disappointed to find you have to pay extra for this feature. 99designs is straightforward to use. The process covers all the factors you need to finalize the perfect design. From the initial brief, which determines your design and style preferences, to the back-and-forth with your chosen designer, each step is well-planned. 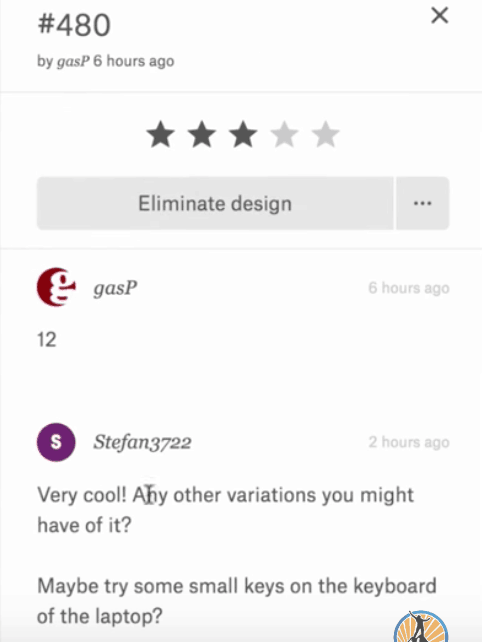 I was particularly impressed with the user interface for reviewing the designs. With so many entries, it could become easy to lose track, but the revisions platform lets you scroll through and reorganize the list for your convenience. In my opinion, the company excels in establishing what you’re looking for in your logo. As most business owners aren’t designers, creating a successful brief is a potential pitfall. Fortunately, 99designs asks all the right questions and gives you several ways to communicate your vision. While the brief section does take some time, I think the amount of detail required is appropriate to ensure a successful competition. Monitoring the contest is fairly simple. 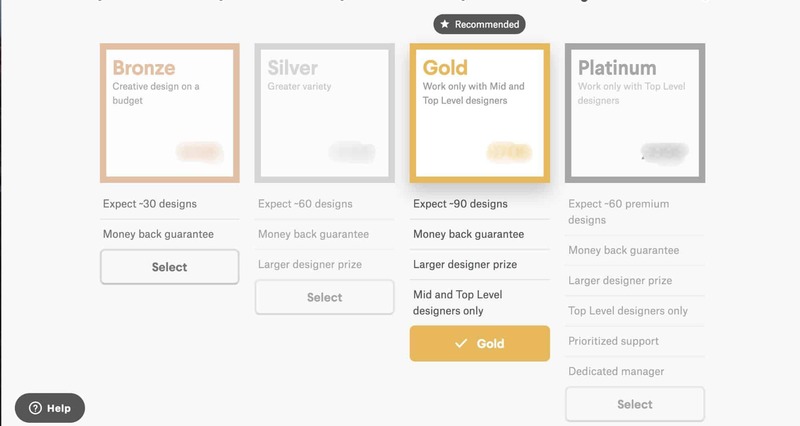 While I initially found it difficult to process the hundreds of different options, 99designs automatically asks you to cut down the number of entrants as you move through the different stages. Opting for my favorite was as simple as clicking the “+” button in the top right of the design preview. It’s also easy to communicate back and forth with artists while the contest is running by commenting on their design. I like that you can ask for changes at any point during the process, as that allows you to develop the logos and add your vision to them. Where things get tricky is toward the end of the competition. Once I decided on a winner, if I wanted additional edits, I was required to pay extra for a one-on-one project on the platform. This can potentially add hundreds of dollars to the overall cost, so be sure you’re happy with the design before you officially select a winner. 99designs provides extensive customer support. If you’re stuck, the first place to check is the FAQ section, which covers most problems you’re likely to face. There’s also a whole section dedicated to providing resources that you might need for design inspiration. The amount of documentation available is considerably more than other contest platforms, such as HiretheWorld and Logo Arena, which provide only FAQs. 99designs also operates a call center for users all across the globe. The numbers are available on the website, and there are lines for numerous countries, including France, Germany, Hong Kong, Argentina, Japan and many more. After I registered as a customer, I received an option for live chat support. This can be accessed via the “Help” bubble in the bottom left-hand corner of the screen. For non-customers, there’s also a ticketed messaging service you can access using your email address. Using the email system was very straightforward. A member of the team, Neil, replied directly, within just over two hours. He resolved my query and even linked me to further information in case I was still unsure. While his reply was fast for any customer service team, it did delay the setup of my competition. If you need instant support, then I recommend that you try the phone option. Overall, 99designs customer service is about as good as it gets. Their multiple channels of support and fast response times mean you can get answers quickly and efficiently. The only downside is that the live chat option is reserved until after you’ve launched your competition. 99designs offers a wide range of price plans. The baseline cost for a logo design contest is around $200. Considering the number of designers this grants access to, the price is good value for money. However, it’s worth noting that things can add up, if you want to use more than the basic package. You can opt for just a logo, or add on branding identity, website design, and social media. Each contest works in the same way, so your decision affects only what you recieve with the final product. While the more extensive packages are useful, you can get similar services for a better price elsewhere. For example, Tailor Brands offers extensive branding tools for social media and business stationary, but it’s nearly ten times cheaper than 99designs. However, it doesn’t give you access to multiple designers. Once you’ve decided the type of contest you want to run, you then choose which package is best — either Bronze, Silver, Gold or Platinum. The main difference between the packages is the number of designers expected to enter. You also get exclusive access to top-level designers if you opt for a more costly package. 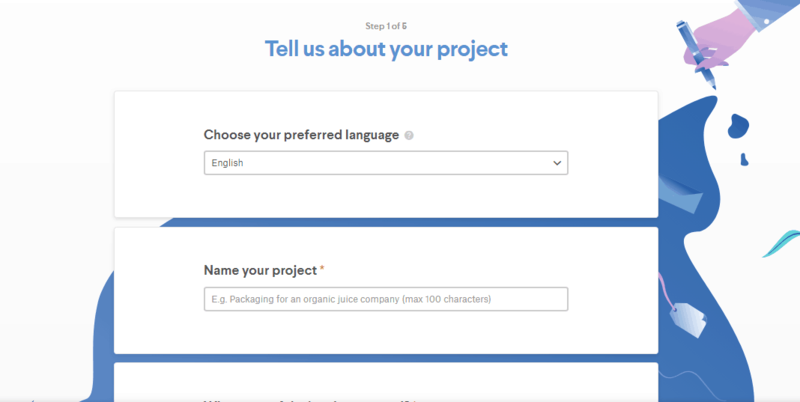 The most premium option also includes a project manager and prioritized support, which is great if you’re too busy to monitor the competition yourself. Compared with other similar services, 99designs is about average in terms of price. In general, basic logo design competitions range from $299 for the bronze package to $1,299 for the platinum package. One major benefit of 99designs is that it doesn’t amass a lot of additional costs. There’s no hidden sign-up charge or listing fee — unlike HiretheWorld, which charges at least $40 extra for listing. However, you do have to pay more for several of the optional features, including private contests, shorter durations, and social media shares. 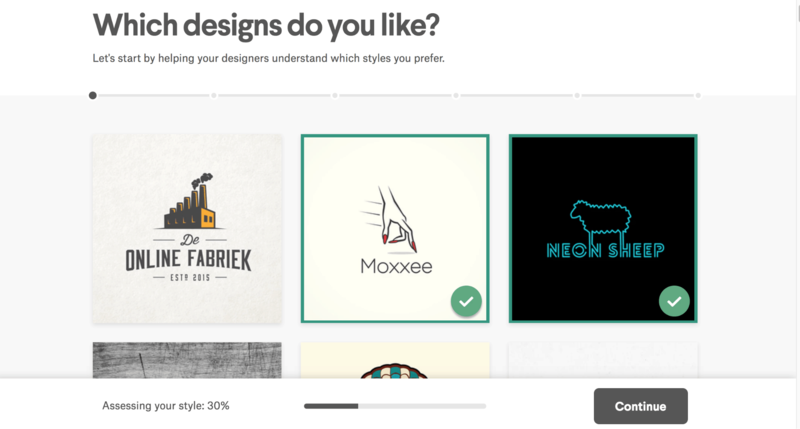 99designs is one of the most popular logo contest platforms, and for good reason. With over a decade of experience, the company has fine-tuned the logo contest process, and there are numerous options for your logo design and business branding needs. Plus, the platform has developed a vast database of designers, allowing you to work with professionals for a fraction of the usual cost. However, there’s a considerable element of risk in crowdsourcing, as you have to guarantee payment for the best designs. Additionally, some of the more extensive price packages are not necessarily worth their cost. But if you’re just launching your company and need help developing your branding, 99designs is a cost-effective way to brainstorm and finalize your business’s visual elements.